The same space that hosts the afternoon high tea transforms into a sophisticated and elegant location in the night. Dim lighting, plush seating and a live band singing some good old classics presents a completely different ambience during the night time and we love it! 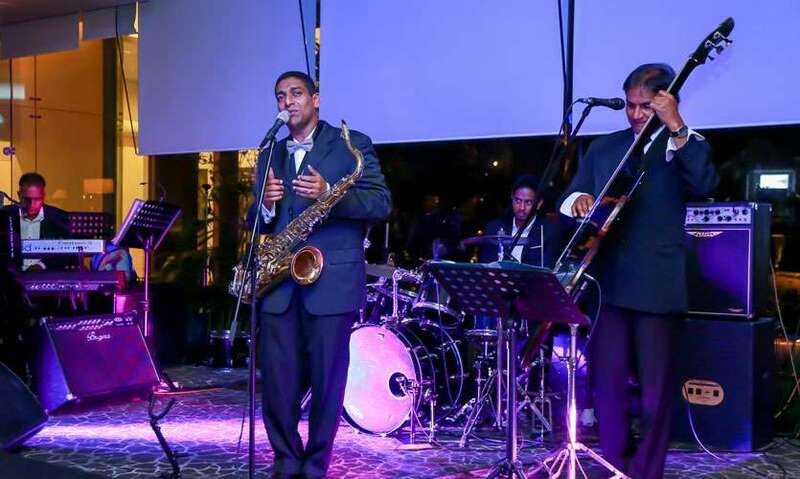 On a quiet Thursday night the LAB Lounge and Bar comes alive with guests of all ages who have come to wind down, enjoy the live entertainment and indulge in some good food. The LAB has created a space and atmosphere for guests to immerse themselves in food and company and even we found ourselves spending nearly three hours at LAB simply enjoying the music, the food and the company. The drinks menu at LAB is quite extensive with a wide range of alcoholic and non-alcoholic beverages. We opted to try their non-alcoholic beverages which covers mocktails, fizzy drinks and milkshakes. For mocktails they have three popular options; pina-colada, virgin mary and mojito. We tried their Pina Colada (Rs. 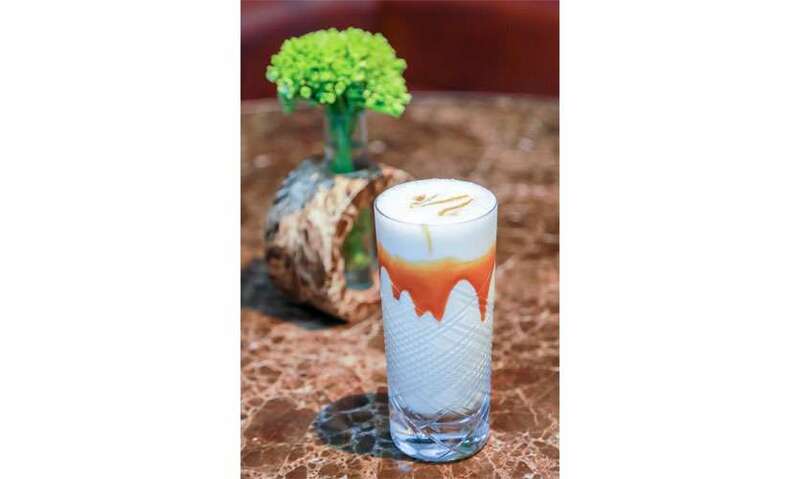 450) which was a sweet blend made with coconut cream and fresh pineapple juice and garnished with a wedge of pineapple. From their fizzy drinks we tried their Citrus Haze (Rs. 450) which was our favourite drink from what we tried. The Citrus Haze is a concoction of orange, lime and fresh passionfruit juice blended in with fizzy water. We loved the sharp tang of the drink that was slightly undercut by a hint of sweetness. Their milkshakes had an interesting variety like the Chocolate Overdose and their Faluda but we were in the mood for caramel so we tried their Salted Caramel M-Shake (Rs. 550). Creamy vanilla ice cream mixed with a thick, sweet caramel sauce made for a very sweet drink. The caramel tends to get deposited at the bottom so make sure you give it a good stir before you drink it! Even though LAB is a simple lounge and bar, their food menu is equivalent to that of a restaurant with a massive variety to choose from. Their bar bites and snacks menu has over 10 different dishes to choose from so we ordered their Japanese Sushi Sampling Platter (Rs. 1490). 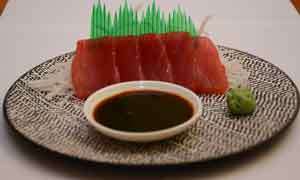 This assorted platter comes with five kinds of sushi ranging from maki rolls to sashimi and nigiri. We thought the platter was value for money and is a dish that’s ideal for two but watch out for the wasabi – we teared up several times from their hot wasabi! 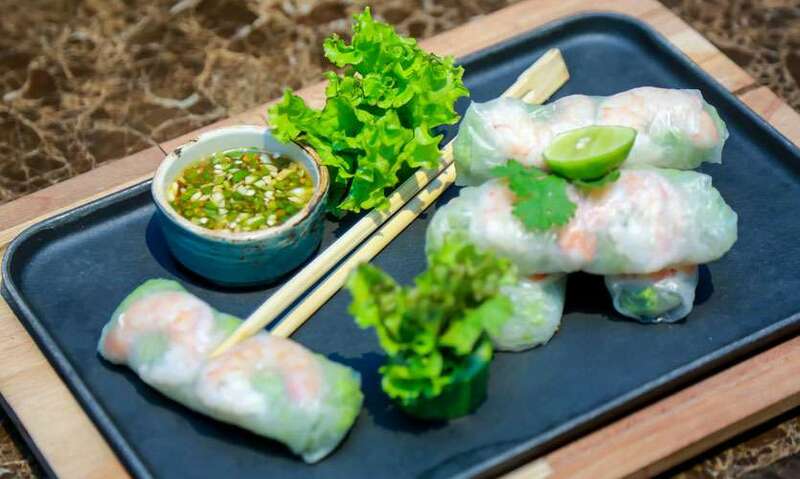 From their starters, we opted for the Vietnamese Rice Paper Rolls (Rs.1190) which in text doesn’t sound all that great but in reality, it was a highlight dish from our evening. Prawns, cucumber, carrot, salad leaves and asian herbs all wrapped tightly in rice paper and dipped in a sweet chilli sauce. Because the ingredients used are so fresh this dish is ideal for anyone who likes to eat clean. Another alternative would be their range of fresh salads. We chose the Watercress and Broccoli Salad (Rs.1580) which was tossed with other vegetables like bell pepper, celery, radish and red cabbage and topped off with toasted almonds. The salad was super refreshing and what was great was that it wasn’t bathed in dressing so you can enjoy the freshness of the vegetables without the taste being lost in an overpowering dressing. Their Sea Bass (Rs. 1590) includes slow baked sea bass fillet with gremolata potato and vegetable salsa. The Sea Bass was cooked perfectly with a crispy skin on top and soft meat that falls apart at the touch. Our all time favourite dish of the night, however, was their Coconut and Crab Risotto (Rs. 1890). 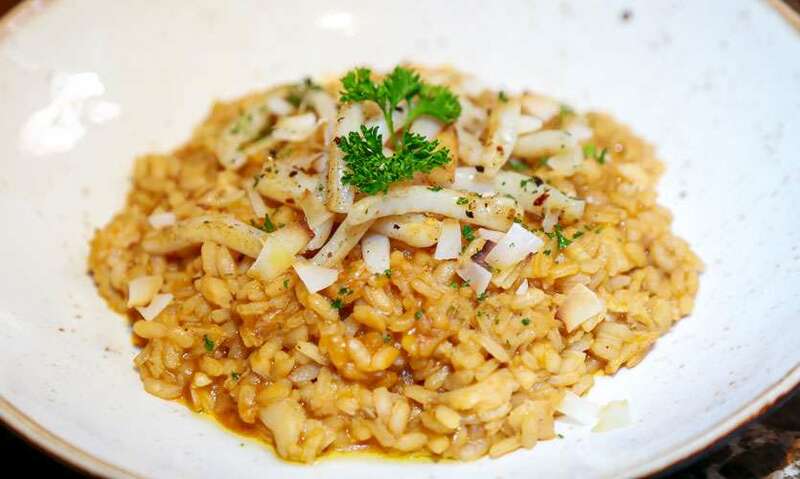 Arborio rice is slow cooked in a shellfish bisque and served with blue swimmer crab meat and grilled calamari topped off with coconut shavings. The flavours from this dish were divine and the slow cooked risotto had completely absorbed the flavours of the shellfish bisque. The portion size was quite generous but a dish as good as this isn’t meant for sharing! For dessert we recommend their Hazelnut Crème Brulee(Rs. 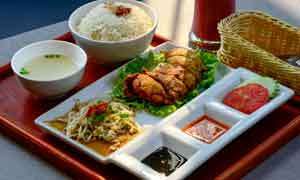 990) which is definitely meant for sharing with its massive portion. 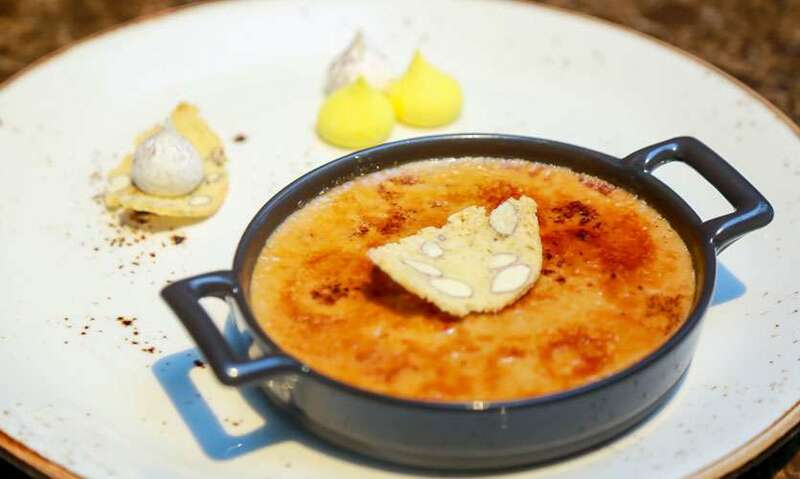 The crème brulee had a crackling top and is served with rosemary and almond biscotti and is the ideal dessert to wrap up your meal. As we said, the menu at LAB is very extensive and we’ve barely scratched the surface with all the dishes we tried out. 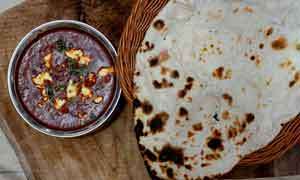 Their menu includes over 60 dishes so you are spoilt for choice. All in all, the LAB at Hilton really has created the perfect set up for a lounge and bar. Good entertainment, creative drinks and good food makes it the ideal location for winding down after a long day!